After a disaster, why do some communities come back stronger than ever, yet others struggle or decline? Flora and Flora (2013, revised 2016) developed the community capitals framework (CCF) to understand how communities function. They determined that communities with healthy and sustainable community and economic development pay attention to seven types of capital: natural, cultural, human, social, political, financial and built. Their research also focused on the interaction among the seven capitals. These capitals are a community’s assets – its strengths, resources and capacities. They bring usefulness, value and quality to the community. The community capitals framework can be a powerful tool to help communities recover from disasters successfully. After experiencing a disaster, a community can review its pre- and post-disaster capitals or use the community capitals framework in the recovery process. McCook, Neb., (population 7,526 in 2016) experienced a drought beginning in 2012 and extending into 2014. In June 2012, the weather station recorded a record-breaking high temperature of 115 F. The annual total rain accumulation was 9 inches, 12 inches below average. By the end of July, exceptional drought encompassed almost the entire state of Nebraska. Droughts are a different type of disaster than sudden-onset events such as tornadoes, floods, earthquakes and hurricanes. Sudden-onset events have an identifiable beginning and end, but the beginning and ending of a drought are more subtle. Likewise, impacts of a drought are different. Droughts most directly damage natural capital, while sudden-onset events are most likely to damage built capital. Also, the ways in which community capitals are used in response to and recovery from drought have distinctive features. For example, instead of focusing on restoring damaged lifelines inherent in built capital, the focus during a drought is on limiting the damage to natural capital, such as farm and ranch land, wildlife and water sources. Pilger, Neb., (population 360 in 2016) was struck by two tornadoes at about 4 p.m. on June 16, 2014. The tornadoes destroyed nearly three-fourths of the small town, leaving a desolate landscape where tree-lined streets, residences and businesses once stood. One of the community’s two churches was destroyed, as was a middle school serving the combined Wisner-Pilger school district with the community of Wisner (population 1,200) seven miles away. Breckenridge, Minn., (population 3,270 in 2016) has flooded several times since the town was founded in 1857, although the 1997 flood likely had the most profound impact on the town’s self-identity and development. What made the 1997 flood unique was the rapidity and severity of the flood and the scope of recovery that affected nearly every aspect of the town, its people and its institutions. As a twin city, Breckenridge is on the Minnesota side of the Red River across from Wahpeton, N.D. Although research literature includes many disaster recovery cases studies, very few have been conducted using the community capitals framework. This project applied the community capitals framework to disaster recovery in these three communities. 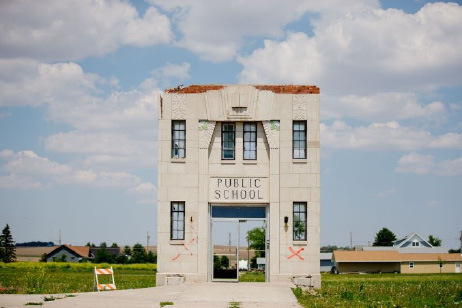 This publication uses examples from the case studies to help Extension educators, business and community leaders, government officials, emergency managers and others inventory their communities’ assets that can be leveraged for disaster recovery. Communities with high capacity in the capitals may be better able to respond to and recover from disasters. This publication provides a process community leaders can use to inventory and leverage the seven community capital assets after a disaster. 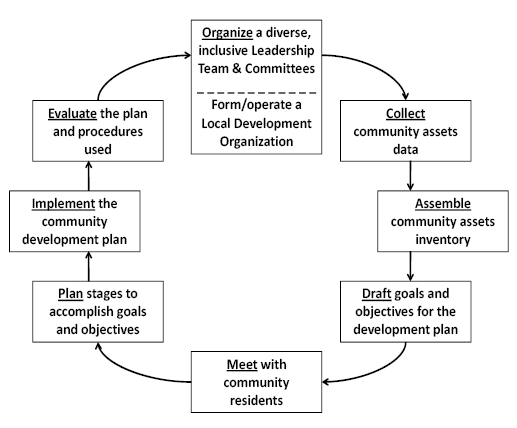 Many of the ideas are taken from Beginning Again North Dakota: An Asset-based Development Program for Rural Communities Using a Community Capitals Framework (2017). That resource can provide more in-depth details. 1. Organize a leadership team. 3. Organize assets into community capitals. 4. Prioritize assets for recovery. Ideally, a recovery leadership team is formed before a disaster strikes. For example, this may be a group organized by local emergency managers or a Voluntary Organizations Active in Disaster (VOAD) group. If one is not established, form a team immediately after a disaster. Membership in this group may be pre-planned and listed in a town’s or county’s emergency operations plan. Or the group may develop organically, with key players in the community initiating the effort. The group may function separately from a long-term recovery committee, whose purpose is to coordinate the mobilization of resources. Once a leadership team is established, the team must determine its function, structure, membership and budget. Function: Why does the team exist? What are team goals and action steps? Is this team going to provide leadership to the long-term recovery committee for the community, or will it work independently? Structure: Who is the leader? Who makes decisions? Who communicates on the team’s behalf? Who has financial responsibilities? Membership: Is the team diverse? Is the town well represented? Does it include members who have influence to get things done? Budget: Are funds available to support the group’s priorities? Can the group apply for funding or work with agencies that can? If a community’s assets have not been documented before a disaster, the leadership team should make this a priority. The leadership team can use the community capitals framework to guide the collection of asset-based information. The team may assemble data from many sources, collect photos and talk with people affected by the disaster. One team member should serve as the organizer of the information collected. This member is responsible for setting up a depository for all the team members to share data. Collecting information on assets can be an ongoing process. Team members should organize the community’s assets — pre-disaster and in the current post-disaster situation — under the seven capitals: built, financial, social, human, political, cultural and natural. Gary Goreham brainstorms Breckenridge, Minn., community assets before and after the flood in each community capital with a focus group of local leaders. Financial capital: businesses, banks, Breckenridge Chamber of Commerce, twin city to Wahpeton, N.D.
To begin prioritizing assets, write the name of each of the seven capitals on large sheets of paper. Place the seven pages on the wall or tables. Go through the information collected, and list each asset in at least one of the capitals. 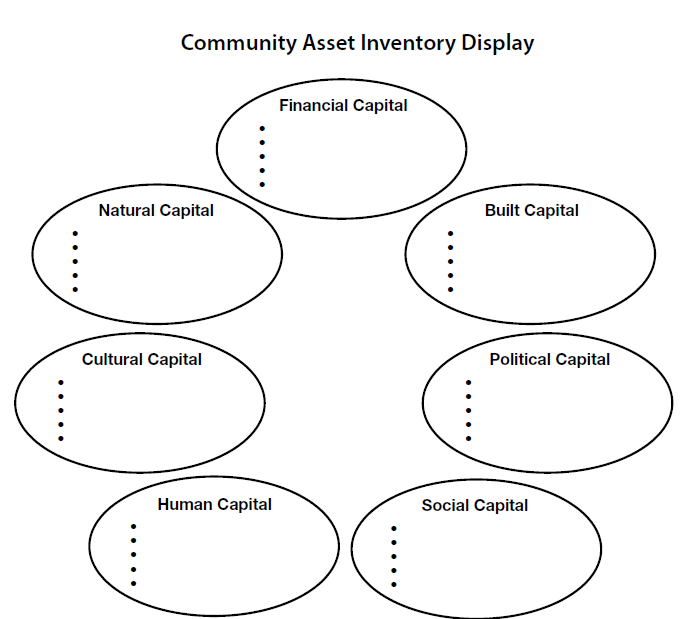 Using the Community Asset Inventory Display, work as a team to prioritize two to five assets per capital. The priority assets will guide how community residents develop recovery goals at a community meeting. Pilger, Neb., Midwest Bank owners announced that they intended to rebuild (financial capital) shortly after the tornado. The Farmers Co-Op (financial capital) followed suit and had bins available for storage by corn and soybean harvest in the fall, and the volunteer fire department (built capital) said it would replace its building. By early September, the city clerk and her husband had replaced their home, and other homeowners were looking into the options to replace or restore their residences (built capital). Throughout the decades, Pilger has persevered during floods, fires and another major tornado that struck 60 years to the month in June 1954. Now, on the road to recovery, Pilger was ready to reinvent itself for not only survival but also prosperity into the future (human capital). Once the leadership team inventories and prioritizes the community’s assets, the team will facilitate the process to leverage those assets. 2. Share draft goals in a community meeting. Now that assets are inventoried, it’s time to develop draft goals for recovery using those prioritized assets to their maximum potential. The leadership team may want to prioritize draft goals rather than take on too much at once. Separate documents might include the asset, the goal, who is in charge of working toward that goal, the tentative plan, a deadline and resources needed. McCook, Neb., focus group participants brainstorm community assets and gaps and vote on priorities. The priority assets and draft goals identified by the leadership team should be presented at an all-community meeting. The community meeting is a time for residents to comment on the draft assets and goals presented, share their ideas for their community and, if possible, come to consensus on how to move forward. Invite all residents for the broadest input possible, but reach out to specific demographics who might be less likely to attend. Invite community leaders who aren’t part of the leadership team. Encourage all to provide input, or use a process where all can provide their input anonymously. The facilitator should be someone who has experience in facilitation and conflict management, and who is seen as neutral. Gather materials to distribute: draft priority assets and goals, official disaster documents or summaries. Develop visuals: PowerPoint slides, wall charts, etc. Welcome attendees, review agenda, share ground rules. Describe the process so far. Share draft assets and goals. Explain that the feedback will be considered and the assets and goals may be updated based on feedback. Explain how community members can get involved to help carry out the goals, how they will be kept up to date on the process and how they can continue to contribute. Recruit volunteers for priority goals during or after the meeting. A second or even third community meeting may be hosted to gather more feedback or buy-in, or to share progress. This community recovery process continues to differ from the work of the long-term recovery committee, which focuses on helping individuals repair their homes, for example, while the leadership team focuses on whole community recovery. McCook, Neb., didn’t have public meetings because of the nature of a long-term drought. Groups and organizations in McCook responded on an as-needed basis to drought impacts. For example, dry conditions increased the risk of fires. Chadron State Park closed to the public for a time to fight the fires. In the years following the drought, focus group meetings facilitated by the research team were held with various McCook sectors. Each task force identified an initial focus and named two co-chairs. Subsequent meetings were held between 2014 and 2016. Each meeting reflected on the progress that the task forces were able to achieve. The mayor of Greensburg, Kan., attended one meeting. In 2007, Greensburg was devastated by a tornado. Since then, Greensburg has made great strides in rebuilding with a focus on green technology. The mayor reinforced the message of hope for the people of Pilger. Breckenridge, Minn., leaders started meeting almost daily as the waters were still receding. City council members, county commissioners, pastors, school administrators, business leaders, non-governmental organization representatives, civic organization members and others organized recovery efforts. The Lend a Helping Hand flood recovery center and program was a result. This organization provided grants to residents both for immediate emergency and long-term unmet needs. Document the plan in an easy-to-read table or spreadsheet that includes details for carrying out the plan: each goal, specific objectives and action steps for each goal, deadline, how the task will be completed, who is responsible, resources needed, etc. Leadership team members should follow up regularly to make sure the plan is being carried out. Leadership team members also should communicate regularly with other leadership team members and the community as a whole. McCook, Neb., financial leaders provided payments through crop insurance programs, and applied for and received federal relief funds for crop failures and livestock feeding. The McCook Economic Development Corporation, which is a public-private nonprofit organization, continued to provide positive branding campaigns and created a positive environment to attract businesses that stimulate the economy following the agricultural impacts. Community members raised $20,000 in funds and received a $10,000 grant from the Tony Hawk Foundation to build a permanent park that offers year-round recreational opportunities that are not dependent on water supply. Pilger, Neb., formed the People Attraction/Branding Task Force to attract new residents and retain young adults (human capital). This task force was responsible for identifying needs of new residents and working with experts on strategies to recruit new residents. During the summer of 2016, a new sign was installed on the highway. Breckenridge, Minn., city officials and emergent local leaders were instrumental in creating the Project Breckenridge organization (social capital) that conducted landscape and aesthetics projects (natural capital). Officials from the local churches leveraged their facilities (built capital) and coordinated with school officials (social capital) to relocate classes to the various churches for the remainder of the academic year. Local leaders emerged and joined with civic and service organization volunteers to form the Lend a Helping Hand organization (social capital). This organization provided grants (financial capital) to residents for immediate, emergency home repair (built capital). Private individuals, civic clubs, churches and businesses contributed nearly $1.8 million (financial capital) during a three-year period after the flood, which served as an unmet needs fund. The leadership team should evaluate accomplishments regularly, realizing disaster recovery is a long-term process. Determine what has been done and what still needs to be done to meet goals. This evaluation process also is an opportunity to revisit priority assets or determine if assets and/or goals need to be changed or added. Although disaster recovery may not be “done” for years, recognize individuals and the community as a whole along the way. Recognizing and celebrating the accomplishment of community development projects can be an important means of enlisting participation and support from community residents for future projects. Inventorying assets may continue as the community sees the need throughout the recovery process. McCook, Neb., continues to experience positive rippling effects of community recovery. The annual festival of storytelling and music continues as a celebration of perseverance among older generations. Newer initiatives, such as a Rural Futures Institute/University of Nebraska-Kearney partnership that offers a health and aquaponics-themed day camp series, educate youth. Pilger, Neb., residents have chosen to mark June 16 as a celebration. In June 2016, that became evident with Pilger Days returning, highlighted by several business open houses and ribbon cuttings, food, street dances, kids’ activities and free swimming at the pool. Since June, several businesses, including Pilger Pride, the local convenience store, have opened, and through fundraising efforts, so has the community center. Both serve as a social capital hot spot. The community center/senior center provides recreational and educational opportunities. Breckenridge, Minn., and Wahpeton, N.D., have named a park along the river Volunteer Park. In April 2017, they placed a plaque in the park again thanking the volunteers who 20 years before gave so much to the cities. This publication provides an overview of how the community capitals framework may be used for disaster recovery in communities. For a more in-depth review of the process, additional examples that aren’t disaster related and sample forms, see Beginning Again North Dakota. Flora, C., Flora, J., and Gasteyer, S. (2016 revised from 2013). Rural Communities: Legacy and Change, |5th ed. Boulder, Colo.: Westview Press. Goreham, G., Tweeten, K., Taylor, C., and Fier, B. (2017 revised from 2009). Beginning Again North Dakota: An Asset-based Development Program for Rural Communities Using a Community Capitals Framework. This project was funded by the U.S. Department of Agriculture North Central Regional Center for Rural Development, Michigan State University, Award # FAR0024260.